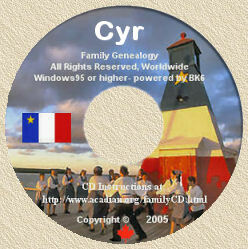 Acadian Genealogy Homepage; Tiny Tafels Produced by Genealogy Programs! Given that there are over 150 Tiny Tafel files on the CD-ROM, the following TWO samples only, will be provided. This is my own Tiny Tafel (Y-CYR.TT) file on the CD. B230 1641 1641 BASSET\Fontenay-leCompte, Rochelle Dioc. B400 1826 1993 BEAULIEU\Drummond, New Brunswick/Lakeshore Hospital, Pointe-Claire, P.Q. B424 1926 1978 BELZILE\Edmundston, New Brunswick./Edmundston, New Brunswick. C650 1641 1970 CARON\Quebec City, Quebec/St. Rene Goupil Parish, Montreal, Que. D252 1958 1958 DESCHENES\St. George Parish, Grand Falls, N.B./St. George Parish, Grand Falls, N.B. D263 1880 1989 DESJARDINS\Grand Falls, New Brunswick/St. Georges Parish, Grand Falls, N.B. D120 1957 1957 DUPUIS\Fort Kent, Maine, USA./Fort Kent, Maine, USA. G255 1645 1935 GAGNON\Quebec City, Quebec/St. Andre de Madawaska, N.B. G350 1960 1993 GOODWIN\Unknown/Dr. Everett Chalmer Hosp., Fredericton, N.B. L162 1649 1895 LAFOREST\France/St. Andre de Madawaska, N.B. L162 1954 1982 LAFORGE\Grand Falls, New Brunswick/St. Georges Parish, Grand Falls, N.B. M650 1678 1989 MORIN\Quebec City, Quebec/St. Georges Parish, Grand Falls, N.B. P200 1904 1951 PAGE\Assumption Parish, Grand Falls, N.B./Assumption Parish, Grand Falls, N.B. P653 1886 1968 PARENT\St. Georges Parish, Grand Falls, N.B./St. Georges Parish, Grand Falls, N.B. P436 1627 1990 PELLETIER\France/St. Rene Goupil Parish, Montreal, Que. P643 1877 1919 PERREAULT\St. Andre de Madawaska, N.B./St. Andre de Madawaska, N.B. P530 1880 1880 PINETTE\Fort Kent, Maine, USA/Fort Kent, Maine, USA. P362 1816 1952 POITRAS\St. Andre de Madawaska, N.B./St. Andre de Madawaska, N.B. R162 1955 1955 ROBERGE\St. Andre de Madawaska, N.B./St. Andre de Madawaska, N.B. R225 1905 1982 ROSSIGNOL\Unknown/St. Andre de Madawaska, N.B. S355 1948 1982 ST. AMAND\Drummond, New Brunswick/St. Andre de Madawaska, N.B. V452 1640 1943 VAILLANCOURT\St. Nicolas d'Aliermont, Rouen Dioc.Fran/St. Stanislaus Parish, (Koska) Mtl. Que. V430 1770 1908 VIOLETTE\St. Basile, New Brunswick/St. Leonard Parent, N.B. This is the Tiny Tafel from the A-MARCUS.TT file.